Semnox Solutions has successfully implemented Parafait at two ShadowLand Laser Adventure Centers in Maryland and Virginia. The five-center ShadowLand Family Entertainment chain is a top entertainment choice in the mid-Atlantic region for families, sports teams, youth groups, and businesses. ShadowLand provides fantastic ‘whole group’ activities for birthday parties, group outings, sports team award nights, adult get-togethers, and office team-building. 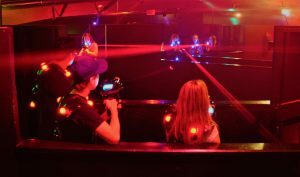 Attractions vary by location but central to all ShadowLands is their massive, multi-level arenas where customers play laser adventures. Players wear lightweight hi-tech suits and enter the misty arena which create a unique sensory experience complete with eerie fog and specialty lights and sounds. The Springfield and Gaithersburg centers of ShadowLand are live on the Parafait suite of products and planning is underway for the remaining locations starting with Chantilly, VA. Parafait helps automate operations to ensure memorable customer experiences while minimizing costs and errors. ShadowLand has adopted the Parafait Point-Of-Sale (POS), self-service kiosks, RFID debit card system, redemption and inventory management, Cloud-based management including card roaming, operations management, and online reporting services. While the POS integrates all transaction points and services into a unified channel, the self-service kiosks enable guests to purchase, recharge and check balances on their cards with maximum technological efficiency. The RFID debit card system makes operations cashless and uses tap-to-play technology. “ShadowLand being a valuable customer, we are happy with the way the implementation has been coming along. We are keen on taking this relationship forward with more projects and value-adding solutions.” says Bepin Jose, president, Semnox (Americas). With Semnox’s redemption and inventory management system, a single staff member at ShadowLand can serve multiple customers while the eZee inventory simplifies tracking of stock and items. Cloud-based management integrates data from various locations and ensures centralized control and reporting. Semnox Solutions LLC (https://www.semnox.com) provides technology and creative solutions for the entertainment and amusement industry. Semnox’s Parafait suite of products is operational at over 1,400 sites spread across 40 plus countries.